There is a fairly large group of coral bottles that seem to be interrelated in some way and form a majority of the obviously early, functional coral bottles. The early group is characterized by a middle range of colour, from pale salmon to a more vibrant, vermilion-salmon colour, but tends not to include anything deeper in colour than, say, Treasury 3, no. 431. They are all well carved, with particularly good detailing of the foot, mostly with symbolic and auspicious subjects, reasonably well hollowed for a material that, because of its fragility, is seldom very well hollowed (although see two exceptions, Treasury 3, no. 434, and Sale 3, lot 64), and appear to have been made during the mid-Qing period, although there are few clues to more precise dating; inscriptions, dates, or signatures are very rare. A number of them are of the rounded rectangular form of no. 431 and so many other mid-Qing bottles, but other shapes are almost as common. Since we know that precious materials that were highly valued by the Chinese would have figured prominently among imperial bottles, it is sensible to consider the possibility that this group is imperial. Here the only possible support for such a possibility, an extremely tenuous one at that, is the vase form. The court was known to favour shapes drawn from other media, particularly ceramics and bronzes, and many imperial bottles are of this range of shapes. 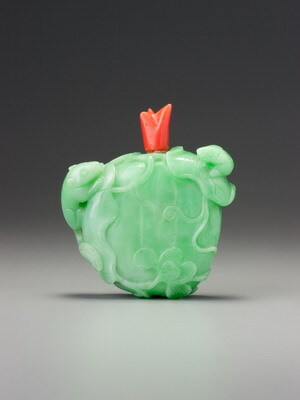 Emerald-green jadeite is always an elegant addition to coral, to such an extent that if a coral bottle lacks a coral stopper of some kind, the chances are it will be matched up with green jadeite. This rather strangely shaped stopper, with its unusual bulge beyond the profile of the collar to provide an excellent grip, has found its ideal place here. So irregular a form would not sit well on the average short, cylindrical neck, which requires more formality, but a long, tapering neck like this can manage the eccentric flourish of an irregularly shaped stopper.